Today WhatsApp is very popular app on windows and android Smartphone, millions of users are use this app because it is easy to use, easy to install and free of cost. How you could download WhatsApp on windows mobile? 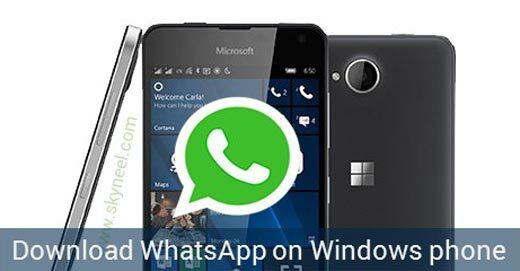 If you want to download WhatsApp on your Windows Phone, then read this post to easily download WhatsApp on windows phone. Many Windows operating systems smartphone gave problem during running the different market apps. But, this problem is resolved with latest windows operating systems on Windows smartphones. Now, you can easily download and run your WhatsApp on Windows Phone. Download WhatsApp feature for Windows Phone is very easy. You can take following given steps to easily download and run WhatsApp directly on your Windows smartphone. If you follow these given instructions properly you’re you can easily run WhatsApp on your Windows smartphone within few minutes. Step 1: You have to open the Windows-Phone-Store Apps on your smartphone. This App was earlier called ‘Market Place’. Step 2: When you select or click on “Market Place”, you will get a screen from where you can choose different options like games, apps, music and podcast. Click on the search button which is placed at the bottom of the screen. Step 3: Type the following app name in the search filed ‘WhatsApp’. When you press enter or return key to start searching you will get a variety of different related app of “WhatsApp”. You can select topmost searched result. Step 4: Notice that you will see review and short description of WhatsApp on Windows Phone. To start downloading this app click on install button which is located at the bottom area of active window. After few seconds, your installation begin start on your Windows Phone. Step 5: After completed few minutes, a message flashed on your screen, that installation is completed. You can check that your app is properly installed or not by opening downloads folder. Finally, you just click on the WhatsApp icon and feed your mobile number properly. After that you get a code from the SMS on your registered mobile number, enter this code in this app. Now, you can set your contact list to use for WhatsApp for starting chatting, send or receive text messages, audio and videos. WhatsApp Windows Phone is now ready for use. Have fun!!!!!!!!!! !